We use GoLite Shangri-La 6’s and 8’s for our advanced (WT3) Wilderness Trekking School courses, and when I outfit Scout High Adventure Programs going into hostile environments. They are light enough. Between the shelters, poles, and a big set of robust stakes, shelter weight comes out to around a pound per person. On our Wilderness Trekking III courses (“Advanced Expedition Trekking”), nobody complains about the weight because all the participants are tough enough, and we have other challenges on those trips (bad weather, getting lost, staying warm, etc.) that are worth complaining about. On Scout High Adventure Treks, nobody complains about the shelter weight because the biggest, toughest kids usually carry the shelter and to complain about it would negate the servant leadership position they are trying to earn. They are tough enough. Having weathered high winds, heavy snows, and driving rain in all seasons and at all altitudes (in the CONUS, at least), none of us ever worry about whether or not the shelter is going to survive a storm. We used to pair these shelters with goofy weight-saving alternatives like titanium skewer stakes and carbon poles, or trekking poles for the support poles. But after breaking poles in storms and having stakes go flying, we ditched those things in favor of strong aluminum poles (we use the stock poles from GoLite), eight Easton Monster Pegs (8″) for the ridgelines, corners, and side mid-points, and 6″ aluminum V-stakes for the rest (4 additional sides, the doors, and the six side guylines. The result is that we no longer worry, and we can camp whereever we want, like Rough Lake (above). They are intimate enough. With a crew, relational intimacy is extremely important. Sure, you can separate everyone in different shelters, but when you do so, you lose opportunities for group communication, and for developing camaraderie. Group intimacy is probably the single most important thing that contributes to the success (which I define as the feeling of “Wow! What an amazing trek!”) of a group trek. A shelter big enough to house the whole group minimizes the formation of a cliques and coalitions, and is a lot more fun. 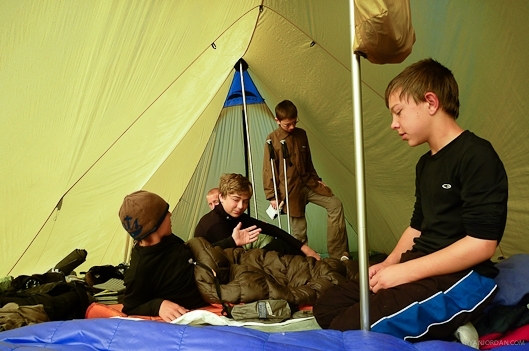 Boy Scout Patrol in a GoLite Shangri-La 8 during their 50-Miler across the Beartooth Plateau, July 2010. PANASONIC TS-1. 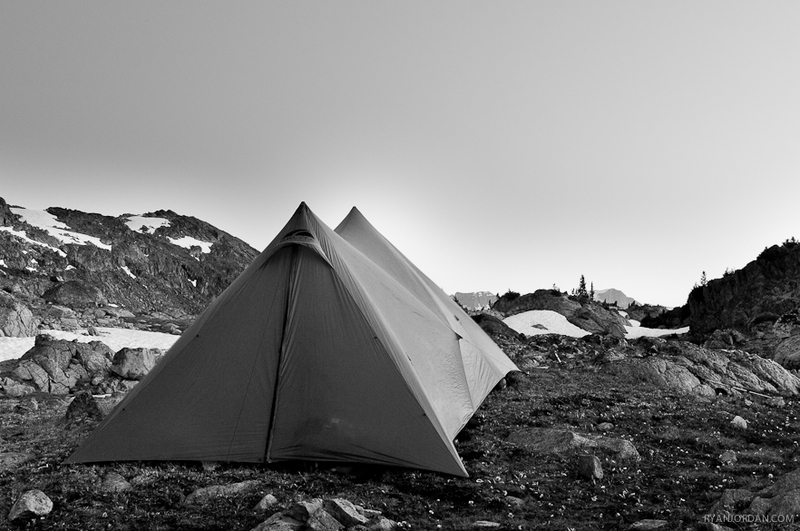 The problem with the GoLite Shangri-La 6/8 is that by the time most of us had the opportunity to really get to know the shelter, and its capabilities, GoLite discontinued it. This is what happens when companies release products before their time and aren’t able to allow a product to mature in the marketplace because of the cash flow and economies of scale constraints caused by low sales volumes. Therma-Rest pads didn’t exactly revolutionize backcountry travel upon their introduction (their cost and reliability prevented mass market adoption for a few years), but thank goodness they stuck with it. I think the GoLite Shangri-La 6 and 8 are the best institutional crew shelters made by anybody. Ever. Now, we’re stuck with splitting crews into two or three big pyramids, which discombobulates group dynamics, results in decreased storm resistance (single pole pyramids are abysmal in heavy winter snows due to their high surface area:structure ratio) and forces us into carrying and having to keep track of, and care for, more gear. Simplicity has its virtues. There are undoubtedly still a few tucked away in bargain basements, so grab them while you can – they’re gems.